Francesco Scaramuzza (1803–1886), Geryon (date not known), further details not known. Wikimedia Commons. 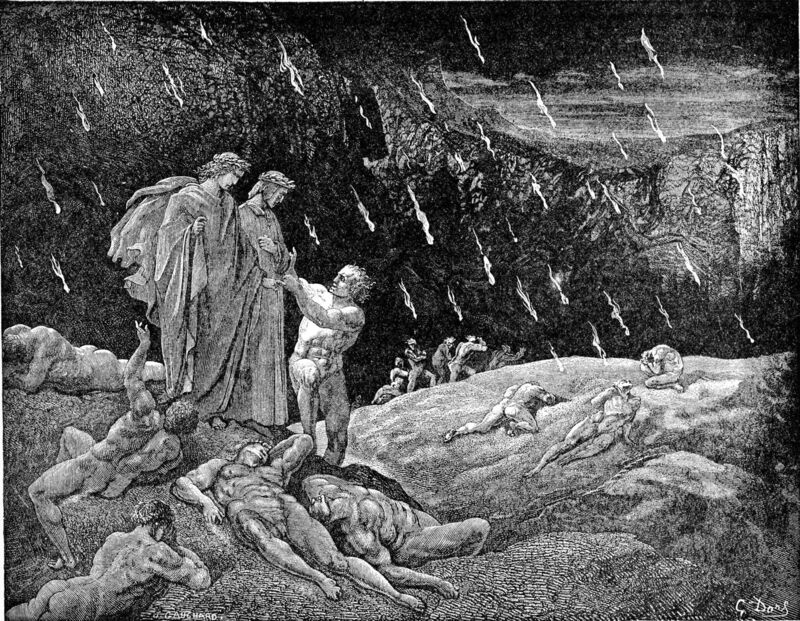 From their tragic encounter with tormented souls in the Suicide Wood, Virgil leads Dante onto a barren and sandy plain, where groups of spirits are in different postures, naked under steady showers of flakes of fire. These fall on their flesh, and set the sand afire underneath them. These groups are being punished for their differing acts of violence against God: blasphemers lie flat on their backs, sodomites are moving at all times, and usurers crouch with purses strung from their necks. 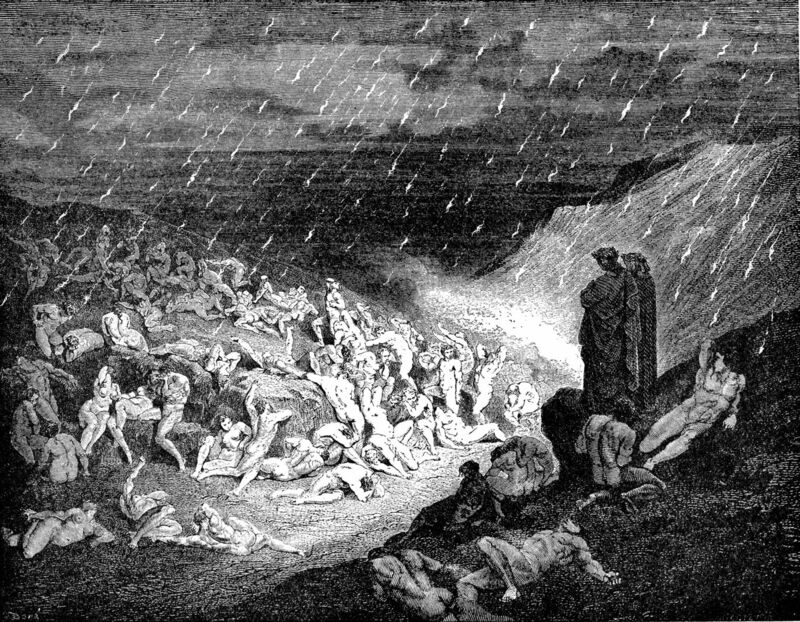 Gustave Doré (1832–1883), The Violent, Tortured in the Rain of Fire (c 1857), engraving, dimensions and location not known. Image by Karl Hahn, via Wikimedia Commons. The two talk with Capaneus, a huge man who was once a powerful king and waged war against the city of Thebes, who is a blasphemer who was struck by a thunderbolt for his arrogance towards the (classical and pagan) gods. Gustave Doré (1832–1883), Brunetto Latini accosts Dante (c 1857), engraving, dimensions and location not known. Image by Karl Hahn, via Wikimedia Commons. Among the sodomites is the prominent Guelph encyclopaedist Brunetto Latini (c 1220-94), who may well have been Dante’s mentor at one time. Also identified are Priscian, a Latin grammarian, Francesco d’Accorso, a legal scholar, and Andrea de’ Mozzi, a bishop of Florence, together with three other Florentines. Virgil explains some more of the topography of Hell, how waters originating from a statue on Mount Idaeus (Ida) on the island of Crete flow down to form the three principal rivers of Hell, the Acheron, Styx and Phlegethon. The statue of the Old Man of Crete has a gold head, silver arms, brass torso, and iron below, apart from a terracotta foot. This follows the mythical ‘ages of mankind’ in descent, and its tears feed the waters of Hell. 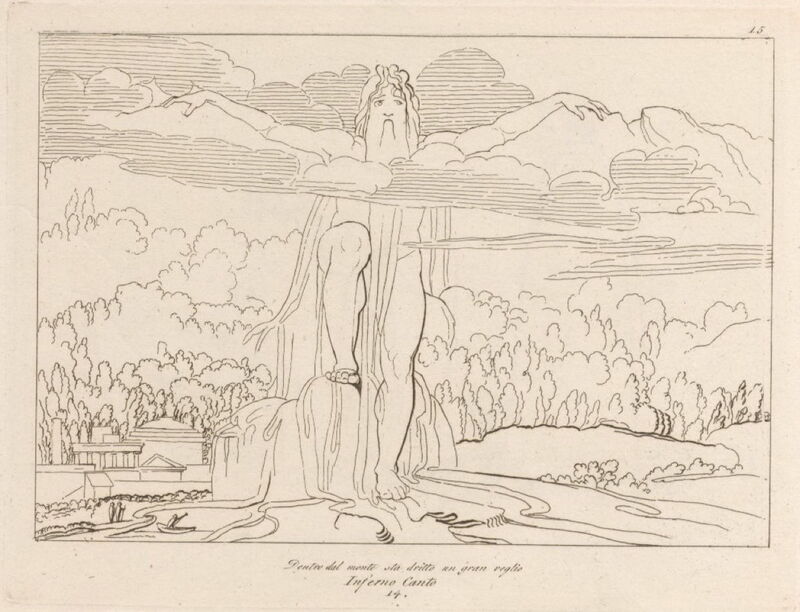 John Flaxman (1755–1826), Inside the Mountain (Divine Comedy) (1793), engraving by Tommaso Piroli from original drawing, media and dimensions not known, Cornell University Library, Ithaca, NY. Wikimedia Commons. 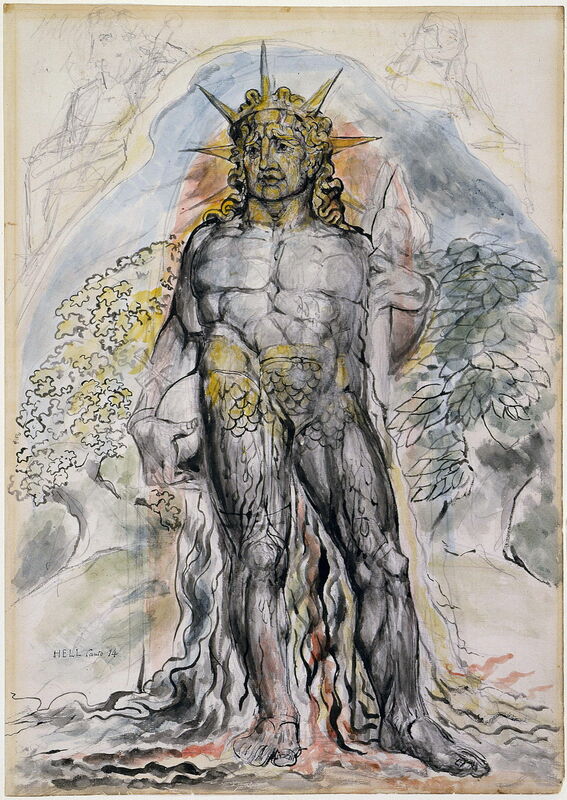 William Blake (1757–1827), The Symbolic Figure of the Course of Human History Described by Virgil (Dante’s Inferno) (1824-27), further details not known. Wikimedia Commons. 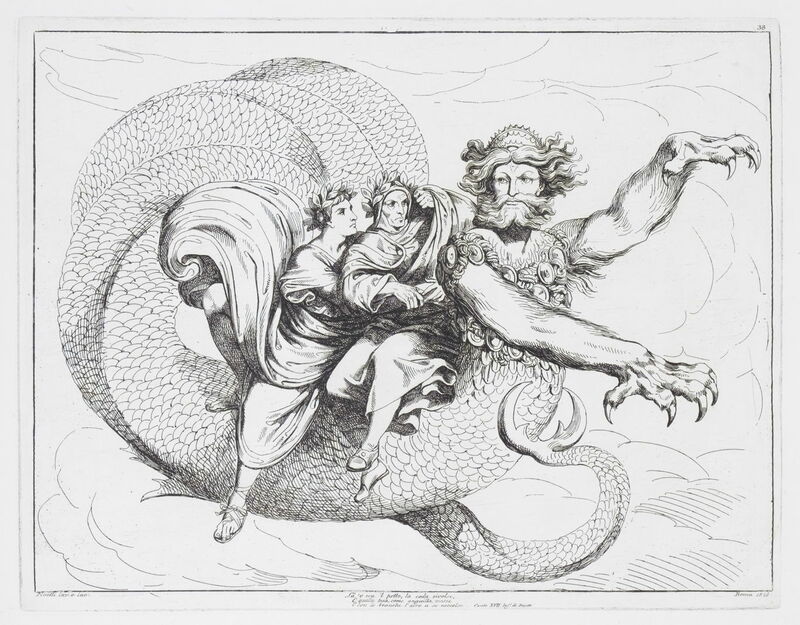 Dante is led down towards a vile monster with the face of an honest man but the body of a serpent, its body seemingly tatooed with knots and whorls, and a sting at the end of its great tail: this is Geryon, in classical myth a cruel king who was killed by Hercules, and here forming an image of fraud. Before reaching that monster, the pair see some usurers on the ground. These are identified as contemporary members of prominent Florentine and Paduan families known for their riches and usury. Gustave Doré (1832–1883), Inferno Canto 17 verse 7 (c 1857), engraving, dimensions and location not known. Wikimedia Commons. 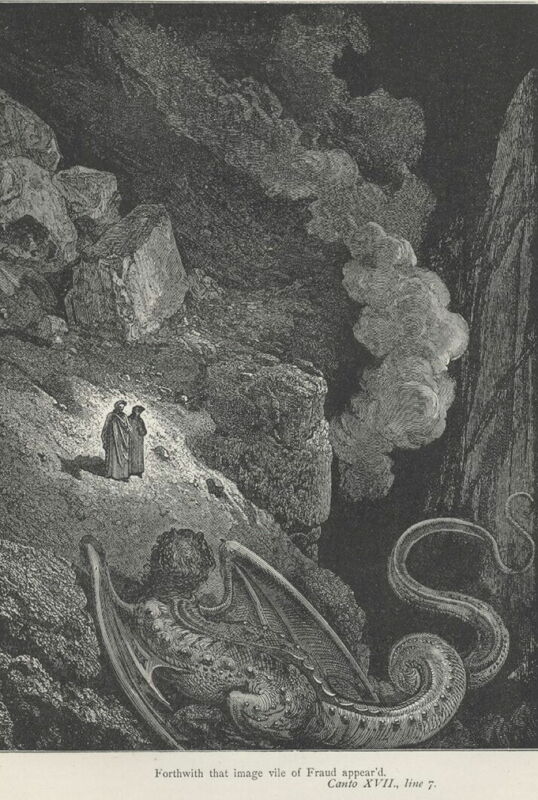 Virgil then jumps onto Geryon’s back, and encourages Dante to have sufficient courage to join him there. 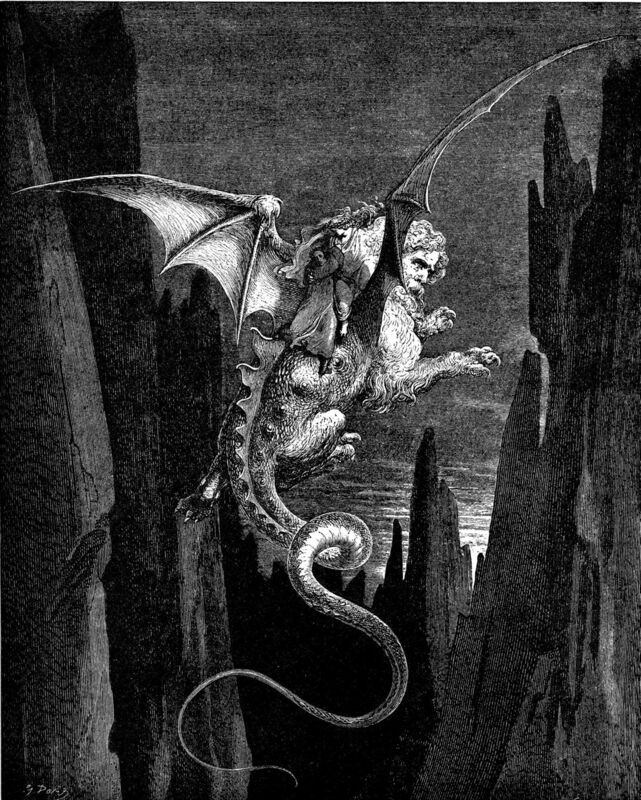 Once they have both boarded, Virgil tells Geryon to fly off, and the monster carries them down through a hundred spiralling turns to the foot of a high cliff. 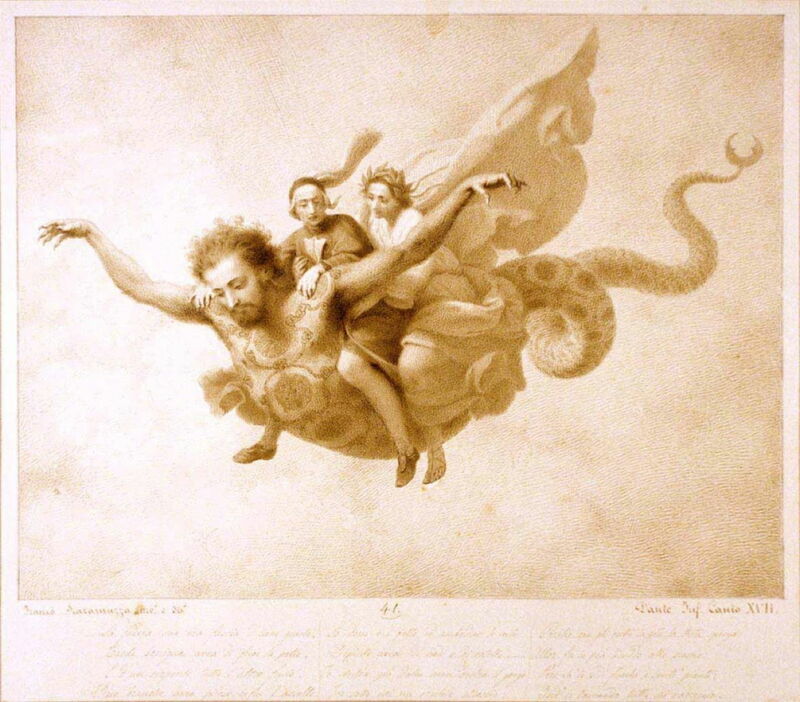 John Flaxman (1755–1826), In the Air of Every Part (Divine Comedy) (1793), engraving by Tommaso Piroli from original drawing, media and dimensions not known, Cornell University Library, Ithaca, NY. Wikimedia Commons. 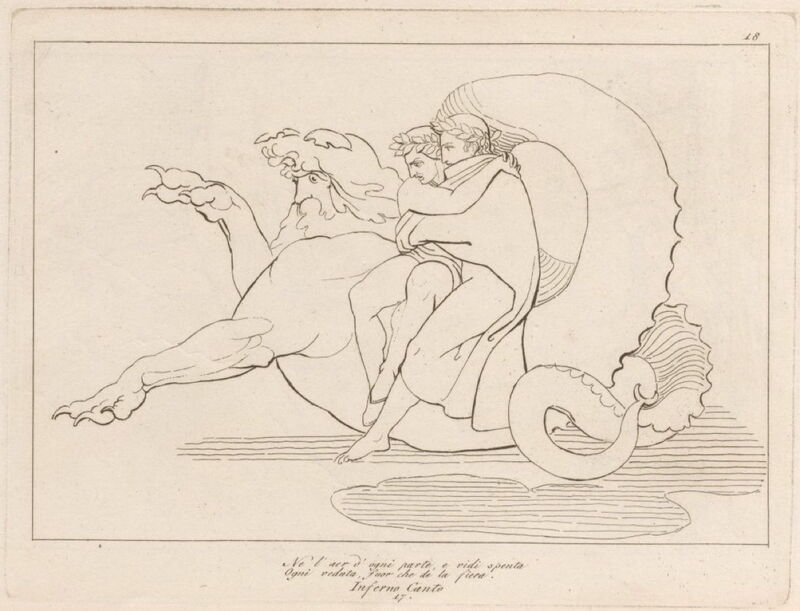 Bartolomeo Pinelli (1781-1835), Virgil and Dante Sitting on the Back of Geryon (date not known), media and dimensions not known, The Wellcome Trust, London. Image © and courtesy of The Wellcome Trust, via Wikimedia Commons. 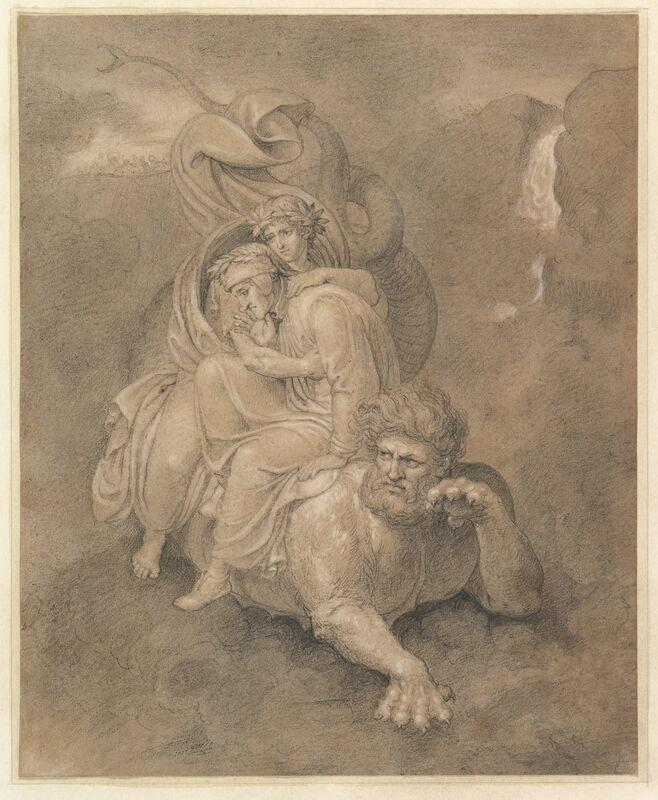 Joseph Anton Koch (1768–1839), Dante and Virgil Carried by the Monster Geryon (1800-22), pencil, carbon pencil and watercolour on paper, 101.2 x 77.1 cm, Thorvaldsens Museum, Copenhagen, Denmark. Wikimedia Commons. Bertel Thorvaldsen (1770–1844), Dante and Virgil on the Back of Geryon (date not known), black and white chalk, 33.5 x 27.3 cm, Metropolitan Museum of Art, New York, NY. Wikimedia Commons. Gustave Doré (1832–1883), The Descent of the Abyss on Geryon’s Back (c 1857), engraving, dimensions and location not known. Image by Karl Hahn, via Wikimedia Commons. Virgil and Dante are now in circle eight. John Flaxman (1755–1826) was a British sculptor and draughtsman who occasionally painted too. When he was in Rome between 1787-91, he produced drawings for book illustrations, including a set of 111 for an edition of The Divine Comedy. 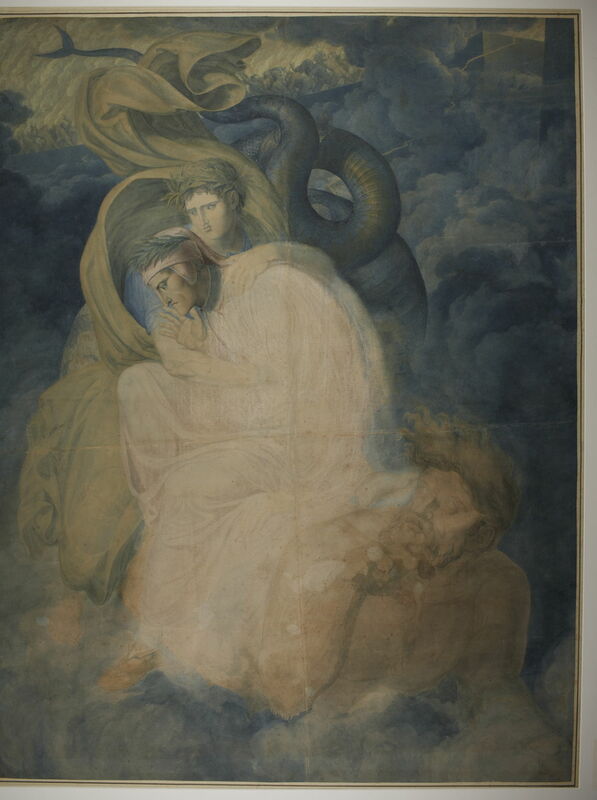 In 1810, he was appointed the Professor of Sculpture to the Royal Academy in London, and in 1817 made drawings to illustrate Hesiod, which were engraved by William Blake. Joseph Anton Koch (1768-1839) was an Austrian landscape painter, who worked mainly in Neoclassical style. During his second stay in Rome, he was commissioned to paint frescos in the Villa Massimi on the walls of the Dante Room there, which remain one of the most florid visual accounts of Dante’s Inferno. He completed those between 1824-29. He also appears to have drawn a set of illustrations for Dante’s Inferno in about 1808. Bartolomeo Pinelli (1781-1835) was a Roman illustrator and engraver who provided illustrations for a great many books, and specialised in the city of Rome. He made 145 prints to illustrate Dante’s Divine Comedy, most probably in the early nineteenth century. Francesco Scaramuzza (1803–1886) was an Italian painter who specialised in mythological and historical narratives. He became quite obsessed with Dante’s Divine Comedy, and for much of his career worked on producing paintings and drawings of its scenes. He worked mainly in Parma, in Italy. Bertel Thorvaldsen (1770–1844) was the greatest Danish sculptor, and one of the foremost in Europe. He worked most of his life in Italy, although the Thorvaldsens Museum with much of his work is in the city of Copenhagen, in a place of honour by the Christiansborg Palace. From humble origins, he trained at the Royal Danish Academy of Art, where he was extremely successful. He arrived in Rome in 1797, and remained there until 1838, when he was welcomed as a returning hero in Copenhagen. Posted in General, Life, Painting and tagged Blake, Dante, Divine Comedy, Doré, Flaxman, Koch, narrative, painting, Pinelli, Scaramuzza, Thorvaldsen. Bookmark the permalink. Thank you for your kind words: I will when I get a chance.